The most characteristic material monuments associated with the ancient nation of Prusia are so called "Prusian Babas". For centuries, combines them with today almost unknown culture of this ancient people. Generally it is believed to be made by the Prusians to express their local deities, distinguished warriors or priests. Many scholars claim that the victims were folding in front of them, others believe that they were placed on the graves of mortals to facilitate contacts with the deities. Still others argue, that, represented defeated enemies or others, they were sculptures of penance. We also find the sentence proclaimed by the other "scientists" that they served the function of boundary stones. In contrast, folklore person sees in them persons enchanted in stone for their sinful life. Many scholars claim that the Prusian baba migrated to Prusia from Asia via Ukraine, Podolia and Pohucie. Most anthropomorphic statues of similar size were found on the Eurasian steppe. However, this trail is completely blind because Prusian baba have actually almost nothing in common with the Asian and Ukrainian babas. The differences are much more than the similarities. As well, they come from different times. Nearly every ancient culture produced stone statues. We find them in Egypt, the Inca and Aztec cultures, Easter Islands, among the artifacts from the Neolithic period. Most theories of pseudo science on Prusia proclaimed by the so-called historians, generally repeated for centuries, and already sounding like a mantra, and not supported stories, that these Prusian baba are the images of some Prusian unspecified ancient gods and were made for their worshiping. Prusian baba considered to be tombstones or presenting the dead whose graves nearby never been able to find. The most common is the view which recognizes baba for presenting local deities. No information provided by medieval chroniclers describing the Prusians beliefs for the preparation of their idols of any kind. Pseudo researchers should put the question, on, of any other Slavic culture influenced on the culture of the Prusians. Yet, everyone knows that the Prusians were already in this area for at least 1,000 years before the Slavs, and the Slavs arrived in the vicinity of the Prusian culture, that since long has been formed. So who would take over from someone patterns ?! The fact is, that it was just the opposite, many beliefs and Slavic cults drew from the Prusian culture already shaped. As others like "scientists" want to, that Prusian baba be a cult statues exhibited often at the burial place or burial, in honor of the fallen warriors on the field and unaccounted for, to provide their likeness. Thus, the theory of local deities, which were supposed to be the Prusian baba, according to them, falls out as well that statues depict deities, but not people! So, as we can see, each of the "scientist" with different explanation. These theories differ not only in the evaluation of individual statues but also in the general sense, and even mutually exclude each other. The funny thing is, that none of these experts provide any evidence for their story and announce it as the only truth. However, to avoid embarrassment another "researchers", they invented such nonsense about statues as being of leaders who died in the unknown place. It was not in custom among the Prusians placing funerary statues (there is no any evidence), so why to craft them for the missing chiefs or those who have no graves? Next to nothing, unsupported theory! Then, why found scarsly only 21 statues and all derived from the same period of time? As we know, the creation of the Prusian babas are dated to the Middle Ages, but somehow none of the Teutonic chroniclers detailing their history, traditions, beliefs and customs of the Prusians, did not write even a word about such a worship or custom, and alone the production of stone statues. Are leaders of a measure Waidewuta or Herkus Monte lived to have a stone likeness? No! Why then honor smaller and almost unknown chiefs or heroes to form their statues? This theory also does not explain anything. In recent years, new theories of another group pseudoscientists - talking about Prusian baba relationships with Ukrainian babas, Turkish, Romanian and Siberian. Firstly, they come from a completely different times. Romanian baba is the creation of statues which dates back to the era of the Neolithic or early Bronze Age. The nature of these sculptures is also very different. Romanian baba fit into the type of Neolithic carvings and nothing special to stand up. Many scholars claim that the Prusian baba migrated to Prusia from Asia via Ukraine, Podolia and Pohucie. Most anthropomorphic statues of similar size were found in the Eurasian steppe. On the Ukraine territory emerged with trypils culture. However, they are a very different sculptures and also been made for completely different purposes. • Prusian baba is only roughly hewn stones, which with the help of a simple concave relief has details or sketch of the face and costume items, weapons. • Ukrainian baba is a sculptures in the full sense of the word. They are spatial sculptures. • Prusian baba only sometimes have scratched relief of the hands or faces ,a Ukrainian baba throughout sculptures, they form spatially carved legs, heads and full shapes of the head and hair. • Ukrainian baba or steppe sculpture of women with clearly marked sexual characteristics (breasts) and Prusian baba are men. Despite the simple relief, readily recognize that these are the male characters - usually have a mustache, and his belt knife, a short sword, and very often the horn. • The Ukrainian baba or steppe tomb sculptures, were always erected on the graves or burial mounds. There is no evidence on the nature of the Prusian baba to be a tomb. • The Ukrainian baba origin is very well documented and their production involves no secrets. Known who and for what purpose performed. They are part of the Slavic cult and a religion headstone sculpture, Scythians and Slavs confirm the religious meaning of their production. Who and why Prusian baba made still is not known and the Prusians religion had nothing to do with them. • The Ukrainian baba were produced over many centuries and Prusian baba only for a short period of time and that was during forced Christianization by the Teutonic Knights. Dr.Janina Sokolowska outstanding Polish archelogist in 1928 drew attention to the differences between the above mentioned groups of statues. Dr.Janina Sokolowska worked at the University of Lodz and the Archaeological Museum in Warsaw. Dealt with the early Middle Ages of the central Poland and Gdansk. She wrote a pioneering work on interested topic of "Castles of an early middleages Polish settlements." In this work, she writes: "... Statues of stone that is found in Polish lands (now Ukraine ed. N.), are included in either the representations of deities, which are found in the annals of the message of the early Middle Ages, or the so-called figures. 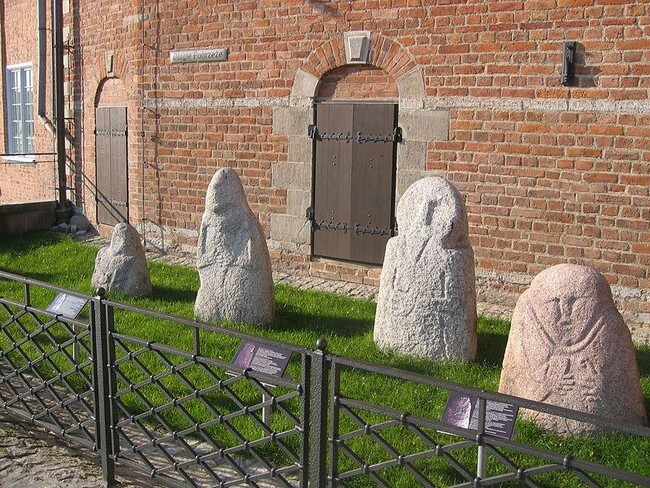 Baba ,, stone ", scattered across Siberia, south - European Russia, former Galicia and also seems to be reaching in Kielce, Kalisz, Pomerania and the Bawaria. Opinions on this matter are very divided, as it often can not be in the absence of clear and accurate evidence, to decide on the nature and meaning of the figures. Uvarov, Demetrykiewicz, Srezniewski, Leger, Conventz (Pomeranian), La Baume (Pomeranian), Niederle (Pomeranian) - include these figures to the group of so-called. ,, baba "; Weigel, however, S. Muller, Niederle (partially), Antoniewicz (Lopuszna) to representations of deities. Specifically the appearance of the Slavic deities figures have been noted in the historical sources. They were wooden statues, huge in size, sometimes decorated with richly and elaborately, eg. with a silver head, mustache gold, with golden eyes - unusual and for their importance in multihead visualized, especially in Pomerania. Whatever, different looks group of Baltic figures. The difference can be seen also in the shape of the vessel, namely, the latter figures wield the horn, and are only men ... "
As you can see from the above quotation already in 1928 has been seen a clear difference between the Ukrainian and Polish baba and Prusian baba. Unfortunately, today's researchers in the service of propaganda do not go so far in their knowledge (or rather ignorance). The researchers gathered information about 21 "baba" and find them to cluster in two distinct clusters: in the area Ilawa and Bartoszyce. This prompts the question why only these two areas? 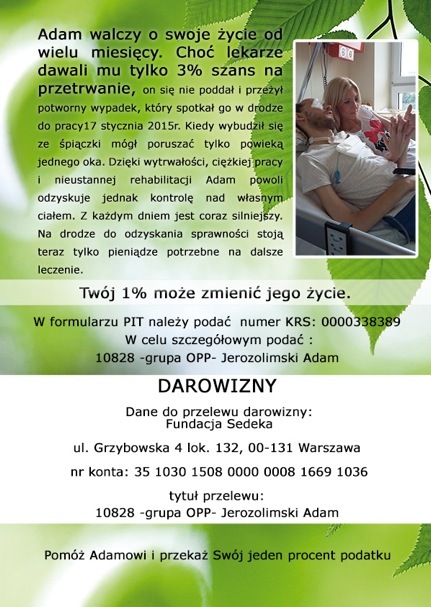 In the Prusian days the castle Bartoszyce belonged to Barths people who lived in the historic land of Barthia. They possessed, in the bend of the river Lyna fortified castle with ramparts. 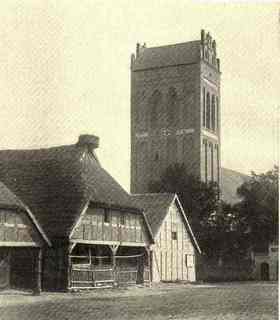 The Teutonic Order in its place in 1240 erected castle one of the first in the Prusian territory. Erected fortress was on the left bank of Lyna and the name given was Bartenstein. 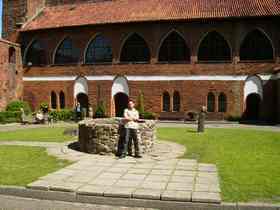 Similarly, in Ilawa Teutonic Knights built a castle for the prosecutor's office, subordinate to religious komturs from Ostroda. Probably it took place about 1305 year, when the city was invested. The fort was in the south-eastern part of the city fortifications, between the church and the Lubawska Gate, on the peninsula of lake Jeziorak and was coupled with the city walls. 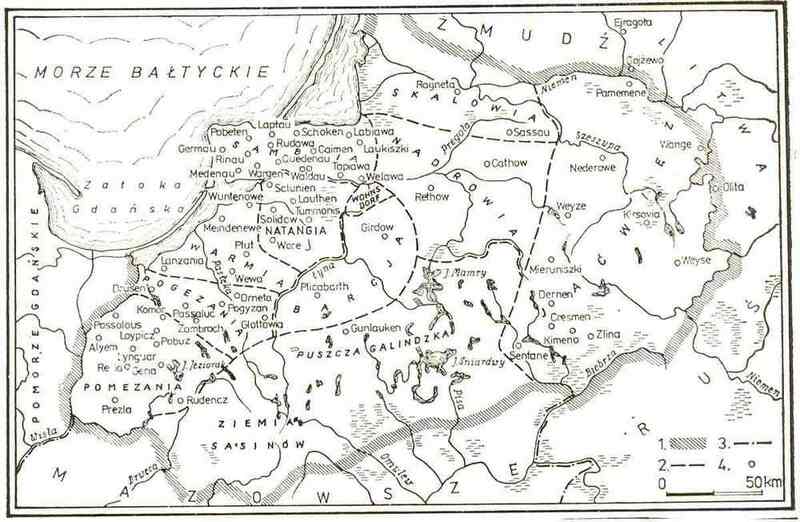 Both Bartoszyce and Ilawa were among the first strongholds of the Teutonic Knights in Prusia. Upon the completion of the Prusia conquest in 1283 year the Teutons crusade was in the crisis, ended the influx of European knights helping Teutonic Knights in their conquest. Prusian lands were considered chrystianized and further crusades lost their sense of more expeditions against the heathen for their conversion. The Teutonic Knights were faced with a big financial problem, to create a mercenary army lacked with the funds and it was not attractive any longer to serve the law for free. Order ran short for the conversion. What could be done to remedy this? The answer is obvious. It was necessary to re-create the myth of the Prusa pagan, who again raised their heads and started to bite representatives of the only correct religion. 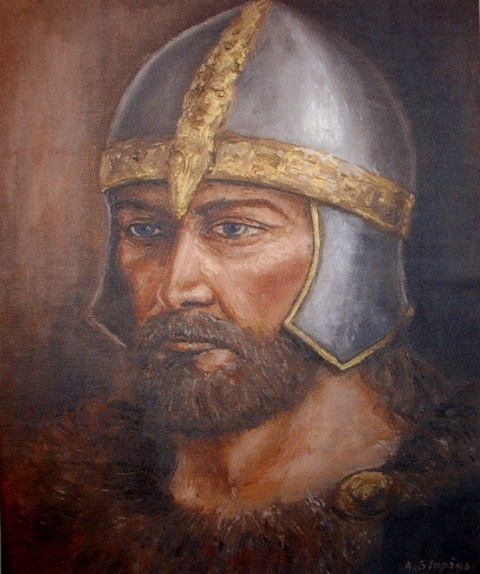 Then Teutons with their chroniclers began to write, of paganism relapse among the Prusians, about washing their baptisms, about making blood sacrifices, etc., etc. There was no evidence for that, so it was worth it, do it yourself to ... All we know that the stone Prusian baba come from that period of time and the fact finding them later in the vicinity of the Teutonic headquarters speaks for itself. To prove it, they invited to the headquarters of the Teutonic knights, influential Europeans to show several Prusian baba, and it was enough to convince guests of the Prusian relapse into paganism, using them as the evidence of the Prusian worship their idols again. There was no reason for a crusade - so the Teutons had to try to get over it! It was done by the Crusaders and they made these Prusian baba for propaganda purposes. The old Roman proverb says: IS FECIT CUI PRODEST - one who done it, one who benefited! Simple! 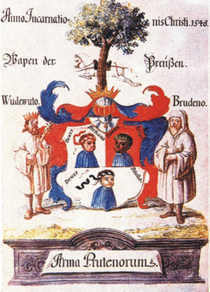 To show their hatred for the paganism, Teutonic deviced in those days special tournaments called the Jerusalem hills acquisition (Jerusalemberg). Gaining at the hill, pagan idol, ended in its overthrow. Is it not a logical explanation for the theory, on the baba performance by the Teutonic masons? 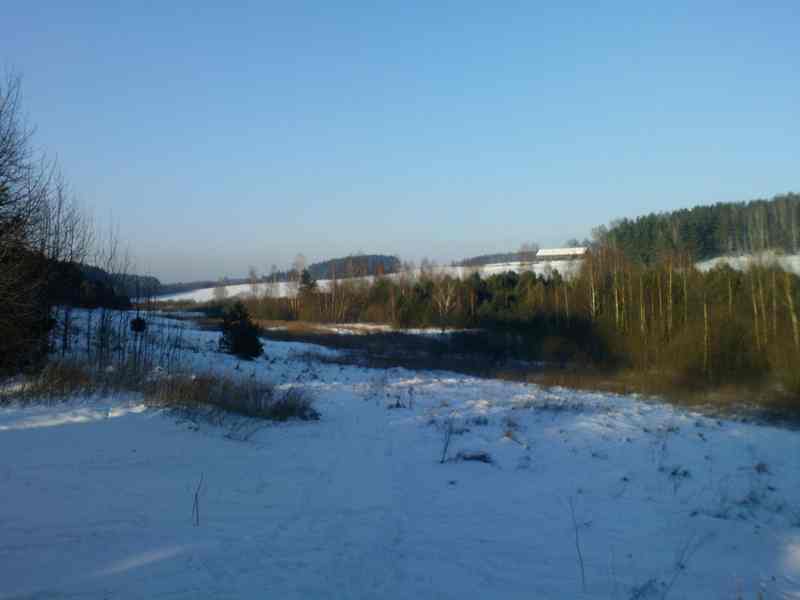 This view is shared by Jerzy Marek Lapo archaeologist and historian with the Museum of Folk Culture in Wegorzewo. He says that the Prusian baba had been created and commissioned by the Teutonic Knights. On this subject, other theories most probably will rise. This work is the layman questions, who is looking for logic in the scientific mess. In the summary should add a little of bitter realism and say, that at the present, polonizing ancient history of Prusia, one has to live long to see the objective and fair treatment of this very interesting and wonderful subject.